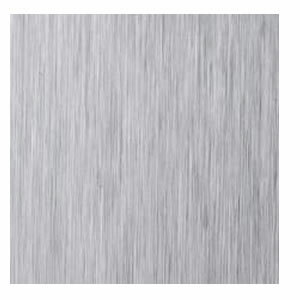 Grade 304 Stainless Steel sheet is a popular and versatile cold rolled product that is available in a choice of surface finishes. On this page, we will be looking at Grade 304, with a Dull Polished surface finish on one face of the sheet only – the description of this sheet is often shortened to “304 DP1”. A Dull Polish is also often referred to as a Satin Finish, or a Brushed Polish, typically because of the lines of the grain that run along the length of the sheet. These are somewhat similar (although in this instance they are completely uniform along the length of the sheet) to brush marks that may be visible on paintwork. Although there are various types and standards of Brushed Polish on the market, all the sheets that we supply are finished with a #4 240 Grit polish. This leaves a finer, tighter & smoother grain when compared to the standard architectural 180 Grit polish. As a result of the finer polish, there are less imperfections in the sheet in which bacteria can sit and therefore the 240 Grit finish is also often referred to as the Dairy Finish or the Sanitary Finish. As standard, the Satin Polish is only applied to one side of the sheet. Once polished, this face of the sheet is then covered with a layer of PVC which is designed to protect the polished surface from becoming scratched during the handling, storage, cutting and shipping processes. Once you have taken delivery of your sheet, the PVC coating is easily peeled off revealing that lovely smooth brushed finish. The reverse of the sheet comes with a 2B finish but is not PVC coated and therefore scratching on this face is to be expected. 304 DP1 Stainless Steel Sheet is FDA approved and therefore it is most commonly found in areas where hygiene of utmost importance. Firstly, if you look in your kitchen you may find examples of Brush Polished Stainless Steel sheet on the front panels of your cooker, on your cooker hood / extractor unit or most commonly on the Splashback behind your cooker. These items can also be manufactured from grade 430 stainless steel; however, this is an inferior grade when compared to grade 304 (aka 18/8) and over time items manufactured from grade 430 stainless steel that are regularly exposed to moisture – for example steam – will begin to corrode & rust, which is not quite so hygienic! Commercial kitchens such as cafés, restaurants and mobile catering vans are often full of Brush Polished Grade 304 Stainless Steel Sheets – due to its easy cleaning, great hygiene, and excellent anti-corrosive properties. In fact, in some kitchens you will struggle to find any material other than Grade 304 Dull Polished Stainless Steel Sheet, with wall claddings, splashbacks, sink units, worktops, food preparation areas, cupboards, food storage containers, cookers / ovens, microwaves and extraction systems all being manufactured from 304 DP1 Stainless Sheet. Should you be looking for a top-quality Grade 304 Brush Polished Splashback for your kitchen, supplied cut to the dimensions that you require then you can order by clicking here. Not only do we supply the splashback cut to your required size(s) but we also offer a wall fixing kit, whereby we pre-drill fixing holes in each corner of the splashback and send it to you complete with wall plugs and screws with decorative heads, making installation of your splash back nice and easy. Again, due to its anti-corrosive and excellent hygiene properties, Grade 304 240 Grit Brush Polished Stainless Sheet is routinely used in hospitals and laboratories. For similar reasons, but with the added benefit of its stain resistance it is also commonly found in public areas such as toilets in motorway service stations, pubs & nightclubs – WC’s, toilet cubicles, urinals, sink units, taps, waste bins, vending machines are all commonly made from Grade 304 Dull Polished Stainless Steel Sheet. Cladding on buildings, pedestrian lifts & escalators, ticket booths / kiosks, trade counters, & point of sale counters. Grade 304 polished stainless steel sheet is suitable for bending – should you require your stainless steel sheet folded, then please contact us for a price. We keep Grade 304 Brush Polished Stainless Steel in 0.9mm, 1.2mm, 1.5mm & 2mm thick and can cut it to size. With quick deliveries and competitive prices, why not give us a try?